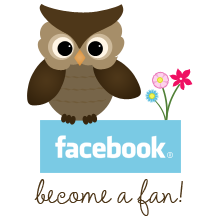 We are super excited to share some wonderful Inspiration and AWESOME PRIZES today with you all! Be sure to grab your favorite drink, and enjoy the Hop!!! You will be entered to Win one of the PRIZES below :) AWESOME right???!!!!! Joanne has offered these super SWEET Gift Certificats to 3 lucky winners, she is super SWEET!! 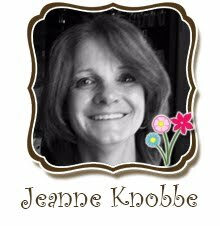 Thank you Joanne!! 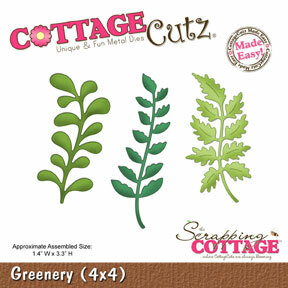 What is your favorite CottageCutz Die? And if you are new to CottageCutz Dies, what would be your 1st pick? The Winners will be posted on July 2nd :) so be sure to check back to see all WINNERS then!!! Hugs to all from The CottageCutz Design Team!!! Hi everyone! Today it's Carol here with a creation made with the Tropical Trio Flowers. This is what I would call a CAS card for me. This is about as CAS as I can get. This card took me maybe and hour and a half. Maybe a smidge longer as my table is a mess and I couldn't find stuff!!!! Don't you just love the tropical flowers? 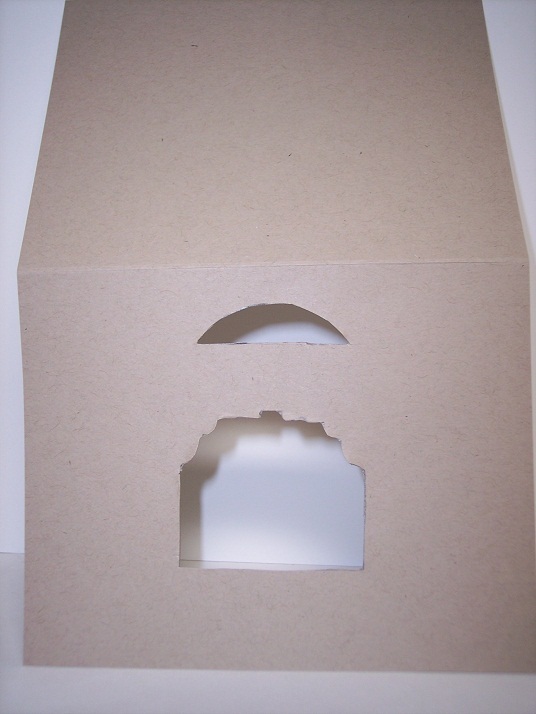 I embossed the panels with a Sizzix folder. 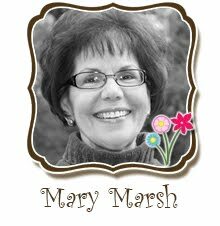 The punched border is a Martha Stewart Punch. This card measure 5-1/2 x 5-1/2. 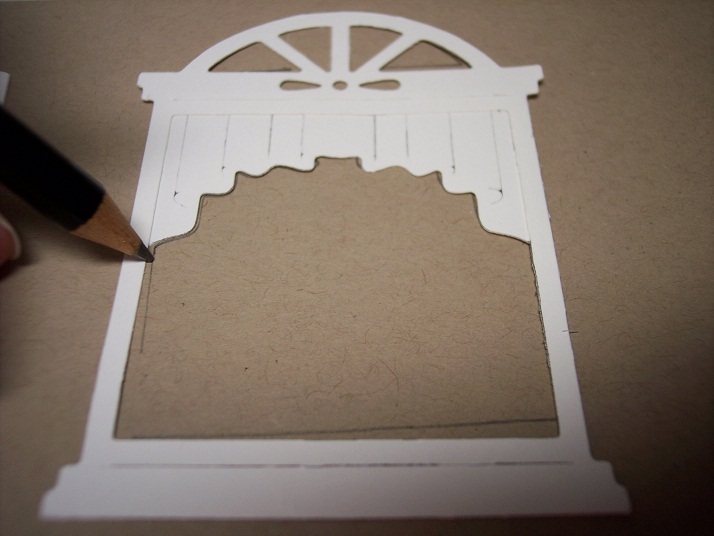 The panels are Designer paper cut at 1-1/4" wide starting at 5-1/4" in length and graduating down 1/2" each panel. 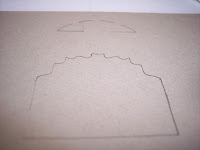 The white embossed pieces are 1" wide starting at 4-3/4" in length and graduating down 1/2" each panel. Here is the Tropical Trio Flower die that I used for this card. Thank you so much for stopping by. 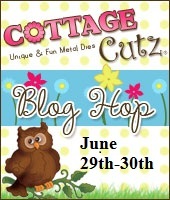 Be sure to come back tomorrow for our Cottage Cutz Blog Hop and your chance to win a fabulous prize. Good Morning! I hope you are all having a wonderful week. It is raining here today in Massachusetts. I sure hope the rains have stopped in Florida. My heart goes out to those who are suffering. Praying for brighter, calmer days. 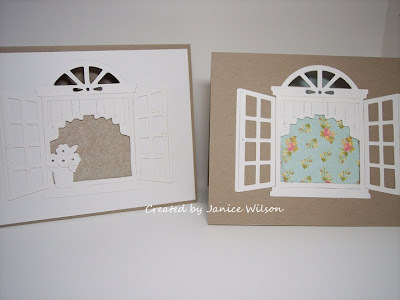 Today I have a couple of cards to share with you along with a mini picture tutorial. I have really been enjoying the look of all white, or almost all white cards. 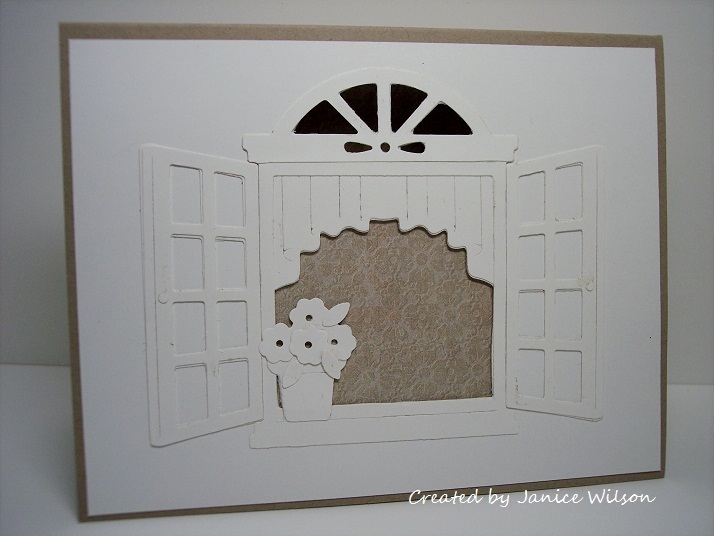 Awhile back I said I wanted to use the CottageCutz Springtime Window die to make an all white card, so here is what I came up with. 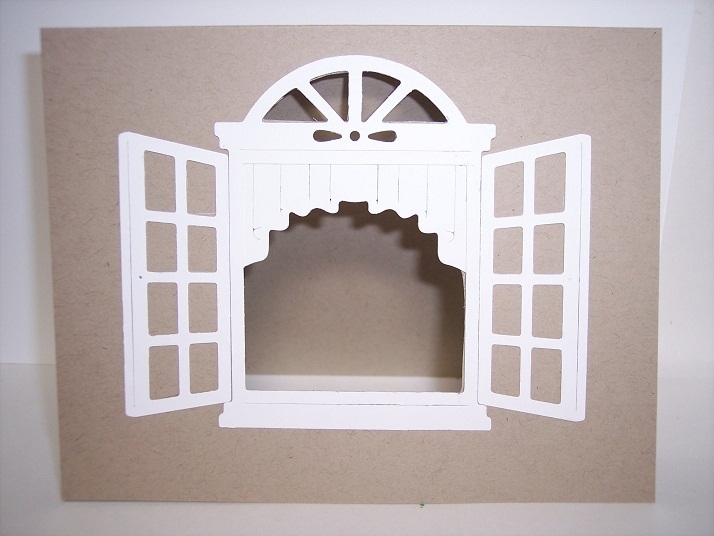 First cut the window from white cardstock. 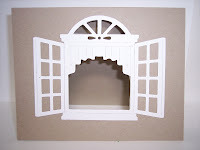 Glue the curtains to the window frame. Place the window onto the card where you would like it to be. Do not glue it down at this point. 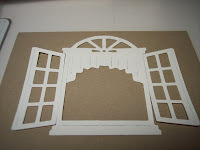 Trace the inside of the window and cut out using an exacto knife or detail scissors. 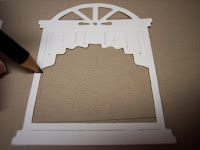 You will want to cut on the outside of the pencil line, so when you glue the window in place the kraft cardstock does not show along the window edge. 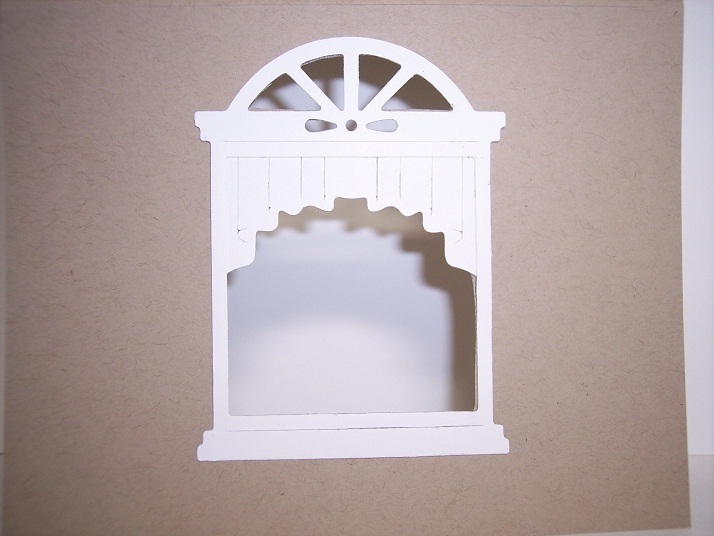 I glued the window frame in place and then realized I missed a step. I forgot the white background, so I just completed the card without it. I think it looks nice either way. I like it when mistakes have pleasant results. 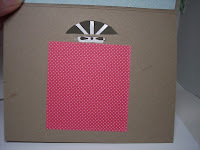 You may choose to leave the window open or place some patterned paper behind it. I chose to use the paper. I hope you like the project I shared with you today. If you have any questions, please ask in the comments. Enjoy your day! 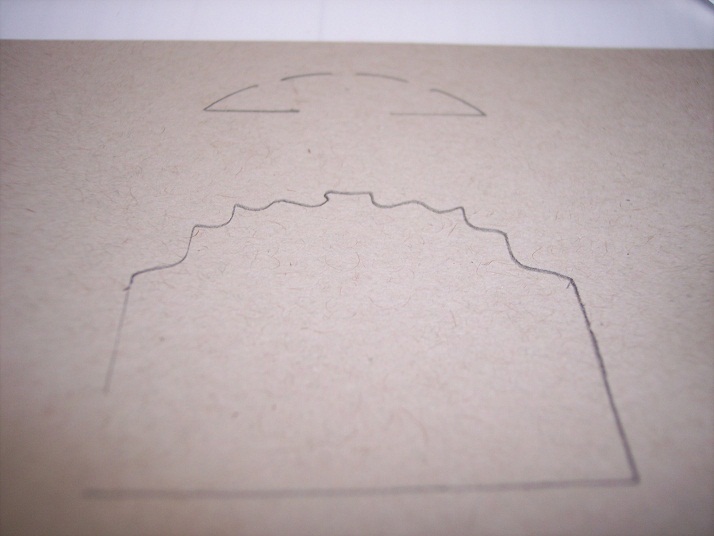 One thing I love about using Cottage Cutz dies is that I can use up a lot of my small pieces of scrap paper for designs like this one, and that's exactly what I did. All of the card stock was from my scrap bin. I did a little flourish stamping behind the wreath for some added interest. I followed through with pearl accents on the flourish, as well as the flower centers. This turned out so sweet and pretty and I hope you like it as much as I do. Below, is a picture of the Spring Vine Wreath CottageCutz die that I used, and if you just click on the picture, it will take you directly to The Scrapping Cottage Store to check it out. It's a dandy!!! Our amazing design team keeps the inspiration flowing here on The Scrapping Cottage Blog, and we certainly appreciate you spending some time with us, your feedback and your kind comments. Have a blessed day, and happy crafting, friends!!! 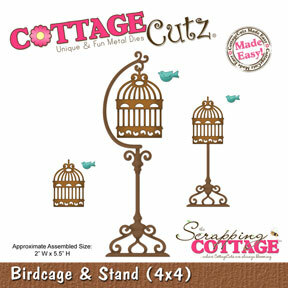 Hi everyone Cindy here with a SWEET CottageCutz Design. I have lots of PRETTY layers for you today. I have used a Scalloped Doily and Plumeria & Leaves. Spring Blossom " LOVE U"
Hello everyone and Happy Friday to all! 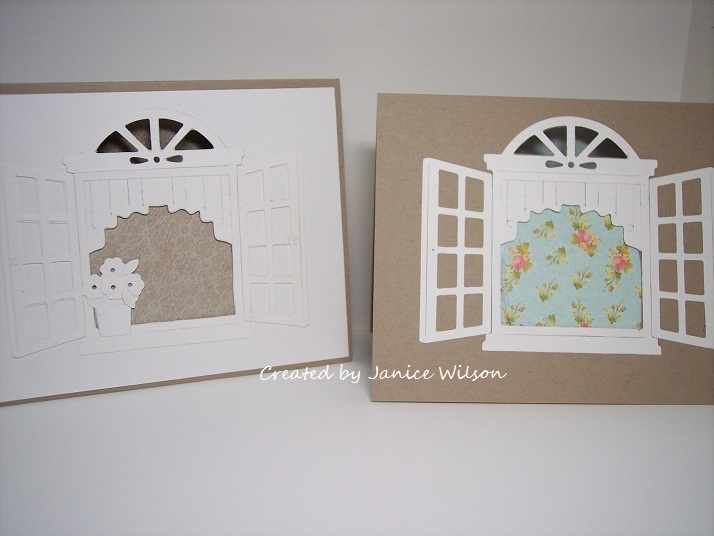 Today I wanted to share my Z-Fold card made for The Scrapping Cottage using the New CottageCutz Spring Blossom Release, and Oval Daily & Frame. So on my card I used the Beautiful CottageCutz Flourish Layered Flower(4x6) die, and the New CottageCutz Spring Blossom Alphabet Die,Oval Doily & Frame (4x6) die, and the SWEET CottageCutz Lace Flower Doily Die! The CottageCutz Flourish Layered Flower was colored with Faber Castell Mix and Match Mixed Media Aquarelles and Ink, I also used Faber Castell Metallic Pitt Artist Pen for the edges of my flowers, that is the blue you see. For the Centers I used Gala Glitz and then added a feather,and 2 stick pins. 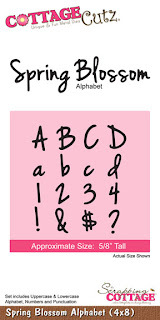 LOVE U, is the CottageCutz Spring Blossom Alphabet Die, I glued them on with Helmars Premium Craft Glue. All CottageCutz Pictures are linked below and will take you to each CottageCutz I used!! I normally dont do Primary Colors, but thought this would be cute in the red,yellow,blue and white! 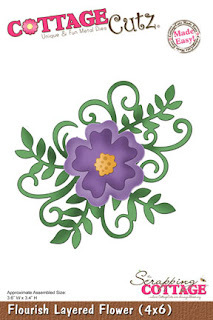 Im LOVING the Spring Blossom Release, and if you havent had a chance to see this Beautiful Collection, you might want to take a moment and see all the BEAUTIFUL designs that are in this one! You can see the entire SPRING BLOSSOM COLLECTION HERE! :) Have fun and thank you for stopping by!!! Isn't this Bird cage and stand darling? It takes me back to my childhood days when both my Mother and my Grandmother had birds as pets. I just love all the detail on this die. For the focal point I die cut the cage with black card stock and the birds with blue card stock. 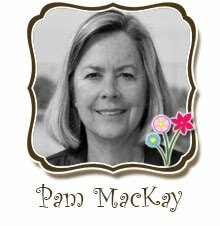 I embossed white card stock with and embossing folder and punched a 3-1/4" x 5" piece of paper with a Martha Stewart Punch. 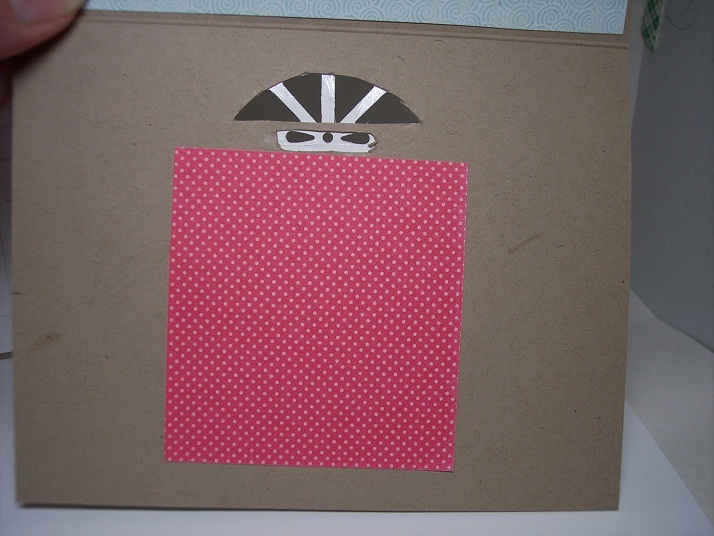 I then layer designer paper and black card stock under this and outlined it with pearls. 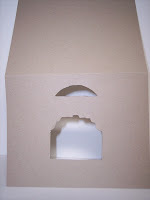 I cut two of the tea time doilies and attached them to the corners. The flower is Recollection and I cut two leaves from the Greenery die and attached them under the flower. 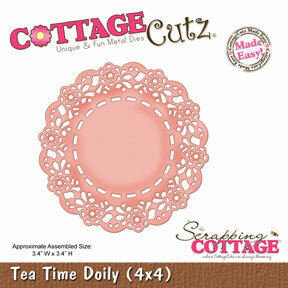 NOTE: Just want to mention that cutting the doilies with Cottage Cutz dies is a charm. It cut perfectly. 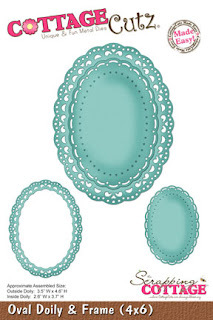 What I liked about this doily as compared to other brands I have tried is that I just had to swipe my hand over the die after cutting and all those little pieces that cut went straight into the garbage. I did not have to "pick" them out of all the holes...lol!!! 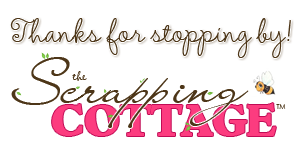 Thanks so much for stopping by today and visiting The Scrapping Cottage Blog. We appreciate it so very much. Here's what I came up with to share with you, and I managed to work in quite a variety of dies with this one, and I hope you like it! 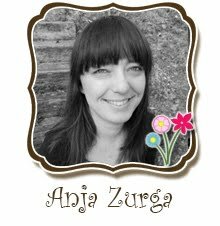 Head over to The Scrapping Cottage and check all of the beautiful CottageCutz dies I've worked with today, plus so many, many more! It's a little difficult to see, but the flower pot, along with the flowers were shaded using Copic Markers on the colored card stock. I normally use white card stock to cut and color, but I wanted to try different types and textures, and it worked pretty well. You just have to experiment and try them out, and be careful, because the more porous the card stock, the more bleeding of the marker you will notice, but as long as your lightest color marker is VERY close to the card stock color, you can achieve a workable blend. 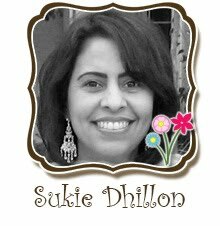 All of the above dies are from the Spring Blossom Release at The Scrapping Cottage. 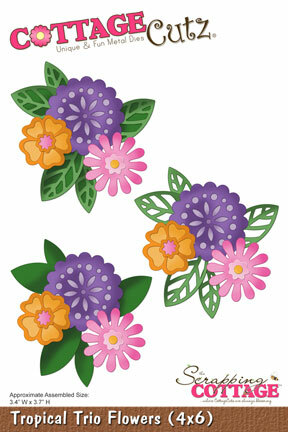 I added the floral panel behind the pot of flowers using the Lace Envelop die from the Tea Time Release. I really love the versatility of this die, because not only can you use it for a gorgeous gift card envelope, but if you cut the pieces apart, you can use it in so many more creative ways. 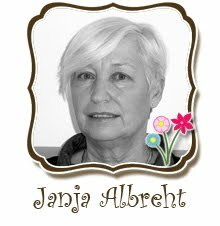 As you can see from the photo, I used the front panel only as the backdrop for my pot of flowers. Have a wonderful day, crafty friends!